University Hospital has been consistently recognized for excellence and high-quality care. The Joint Commission awarded University Hospital a Certificate of Distinction for Advanced Certification in Comprehensive Stroke Center. University Hospital is fully accredited by The Joint Commission. 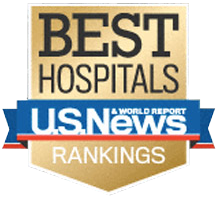 University Hospital ranks among the Best Hospitals in Northern New Jersey and the New York Metropolitan area, according to \ Best Hospitals rankings, published by U.S. News & World Report. University Hospital is also recognized for "high performance" in the clinical specialty of Nephrology. Get With The Guidelines SM (GWTG) is an evidence-based program for in-hospital quality improvement. It puts the expertise of the American Heart Association and American Stroke Association to work for hospitals, helping to ensure that the care they provide to coronary artery disease, stroke and heart failure patients is aligned with the latest scientific guidelines. UH was awarded Gold Plus and Target Honor Roll for advanced heart failure care, while our stroke program was awarded Gold Plus and Honor Roll-Elite Plus. University Hospital is the only hospital in northern New Jersey and one of only two in the state certified in Advanced Heart Failure Care by The Joint Commission. American College of Surgeons National Surgical Quality Improvement Program (ACS NSQIP®). American College of Surgeons National Surgical Quality Improvement Program (ACS NSQIP) is the leading nationally validated, risk-adjusted, outcomes-based program to measure and improve the quality of surgical care in the private sector. ACS NSQIP has the tools, training, customization options and, most importantly, data, to keep hospitals ahead of the curve. University Hospital is a participant in this quality improvement program, which has as its goal to prevent complications, save lives and reduce costs. U.S. Department of Health and Human Services (HHS) Health Resources and Services Administration (HRSA) is focusing efforts on reducing the gap between potential organ donors and needy recipients. The principal aim of this effort is to encourage hospitals to achieve and maintain organ donor conversion rates exceeding 75% or higher of eligible donors. Healthgrades has pioneered hospital quality rating since 1998, with the purpose of helping consumers understand, compare and evaluate hospital performance. Healthgrades evaluates hospitals solely on clinical outcomes: risk-adjusted mortality and in-hospital complications. Hospitals receive ratings for each of the procedures and diagnoses depending on how well they perform above or below the predicted average. Hospitals are also recognized for superior outcomes for specialty excellence, clinical excellence and patient safety. The Mission: Lifeline Recognition Program of the American Heart Association acknowledges University Hospital for its efforts to improve the quality of care for heart attack patients. This national recognition means that University Hospital provided high quality cardiac care as measured by accepted standards including timely, evidence based treatment with angioplasty and medications proven to improve outcomes for heart attack patients. A STEMI is a serious type of heart attack that involves damage to the full thickness of the heart muscle. University Hospital’s medical staff includes 56 physicians named to the Castle Connolly “Top Docs” directory. The mission of Castle Connolly Medical Ltd. is to help consumers find the best healthcare. To this end, it publishes the "Top Doctors" series. The top doctors who are listed in the directory were nominated by their peers in an extensive survey process of thousands of American doctors each year. These Top Doctors' medical educations, training, hospital appointments, disciplinary histories - and much more - are screened by the Castle Connolly physician-led research team. Those doctors who are among the very best in their specialties and in their communities. University Hospital was one of only three hospitals in New Jersey to receive the Healthgrades Neurosurgery Excellence Award. This American Heart Association initiative recognizes success in implementing specific quality improvement measures for treating patients who suffer the deadliest form of heart attack, known as a STEMI. University Hospital’s EMS is the only one in New Jersey to receive the highest award possible under the Mission:Lifeline program. The American Nurses Association recognized University Hospital for its commitment to quality patient care in 2014. The recognition is part of the Association’s NDNQI initiative that focuses on outcomes and helps document how nursing care is an important component of overall quality. University Hospital was named one of the State’s Top Hospitals by “Inside New Jersey,” the Star-Ledger’s magazine. The hospital received special recognition for care in breast, prostate and pediatric cancers; heart surgery; hip and knee replacement; heart failure and stroke care; high-risk pregnancy; and the treatment of neurological disorders.